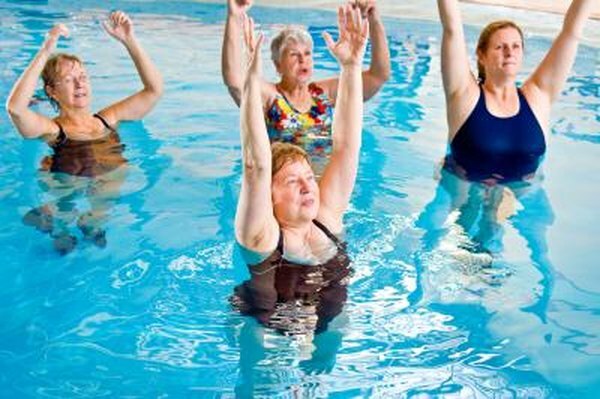 Water exercises are particularly effective for people with physical limitations that preclude them from high-impact aerobics and other forms of exercise. The water provides buoyancy that helps with balance and resistance to improve muscle tone. Shallow water exercises, performed correctly also can provide cardiovascular benefits and aerobic training. According to the National Multiple Sclerosis Society, aquatic exercise improves flexibility, mobility, endurance and balance. You can increase muscle tone and target flabby legs and thighs with back leg lifts performed in the shallow end of the pool while hanging on to the side. Stand erect and slowly raise one leg backwards. Keep your back straight as you hold the position for a couple seconds and then lower your leg. Repeat 10 times and then switch to the other leg and repeat. You can vary the exercise by adding side lifts to your routine for additional toning on the inner thighs. Lift each leg to the side, hold for a few seconds and lower it. Repeat 10 times on each side. Marching in place in the shallow end of the pool can provide both aerobic and muscle toning benefits. You can start slowly by lifting each knee a couple inches off the pool floor and increase the movement until your knee is fully extended toward your chest as you become more limber. Beginners can hold onto the side of the pool with arms outstretched and march in place. As balance increases, march across the width of the pool, keeping back straight and abdomen pulled in. You can keep your arms held straight at your sides or engage them in a marching swing, bending the arm opposite the leg that is raised as you march back and forth. Increase the speed as you build endurance. Weights are available that attach to your ankles and wrists to increase the resistance of shallow water exercises. According to Los Angeles Trade Tech, the most effective exercise routines using waterproof weights are performed in circuits, performing 10 repetitions of each move and quickly moving on to the next exercise. A series of exercises designed to work the upper body include punches across the chest, shoulder shrugs and arm swings. While standing erect in the shallow end of the pool with abs tightened and legs about shoulder-width apart, you can perform bicep and tricep curls in the water. Lower body exercises with weights attached to the ankles include sidekicks, lunges and marching.